It is remarkable how many delicious vegetables you can fit into a small growing area or raised bed. Tomatoes, zucchini and potatoes can all be squeezed into tight spaces. The key to success is ensuring you make the best use of the space you have with clever planting techniques and the right crops. Seed companies are frequently producing new varieties of vegetables that can be grown as dwarf plants, in small areas and even in pots. Even large squash plants come in varieties that can be grown up a trellis (saving much-needed soil space), and you can grow a decent crop of eggplants from just a couple of dwarf plants. Dwarf varieties grow well in containers whereas climbing ones make excellent use of vertical space (such as walls and fences) whilst also looking attractive. Many salad leaves, such as rocket, are expensive and taste of very little after they have been packed and then left on a supermarket shelf. The leaves are easy to grow and take up very little space. They can even be grown amongst other plants, to maximize soil space. If you only have a small space in which to grow vegetables, you should grow crops that will be out of the ground within a few weeks rather than months. If you are growing potatoes, grow new potato varieties that will be ready to eat in July rather than maincrop varieties which may not be ready until September. Have seedlings of other vegetables on standby, ready to go straight into the soil as soon as your first crop has come out – brassicas such as winter cabbage or broccoli seedlings can be planted after you have harvested all your peas or beans. Further, if you leave the stumps of the peas and beans in the ground after you have removed the rest of the plant, their roots will continue to provide nitrogen to feed your hungry cabbages. You could try growing fast- and slow-growing crops together, or ‘intercropping’, to maximize space. Many crops that eventually take up a large amount of space (such as tomatoes and potatoes) do not actually use this space until they have reached their full size. Take advantage of this by planting a few fast-growing radishes, salad leaves or beetroot in the soil in between rows of the larger plants. By the time the space is needed by the larger plants your fast-growing crops will be long gone. 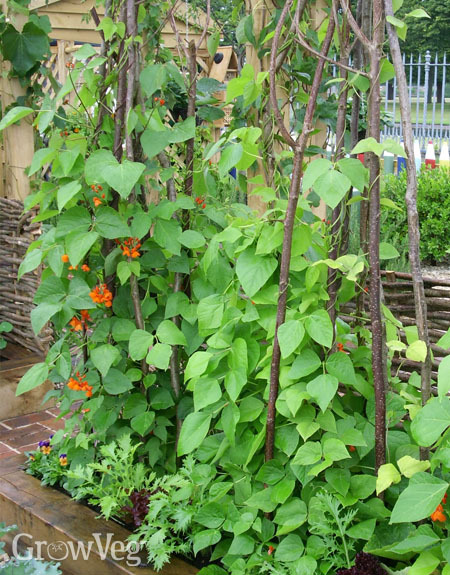 It is also worth training late climbing bean plants up sweet corn, sowing lettuce seeds among your tomato plants, and spinach in between broad beans. If you are looking for a step-by-step guide to getting the maximum harvest of vegetables from raised beds then take a look at our article on the Square Foot Gardening method. If space is limited, choose crops which you love to eat and which are expensive to buy in the shops. Avoid growing crops that take up a large amount of space (such as asparagus) or take months to grow (such as pumpkins or parsnips). Grow fast-growing crops (such as lettuce, radish and beets) around the base of larger plants (such as potatoes and tomatoes). Have seedlings of crops on standby to go straight into the soil once you have harvested the previous crop.